The French Bulldog is a pleasant, easy-care companion, who is playful, alert and affectionate. Enthusiastic and lively, but are not yappy and loud. Curious, sweet and absolutely hilarious; they have a very comical personality and love to clown around. They are bright and easygoing. The Frenchie gets along fairly well with strangers and other animals and enjoys being with their owners. They play well with other dogs. Those Frenchies who are allowed to believe they are alpha may become dog aggressive. This breed needs leadership and will not thrive without it. The Frenchie cannot be owned and ignored. When they sense an owner is meek or passive towards them they will become very stubborn and even snappish. They can be trained if the owner is calm, but firm, consistent and patient. Proper human to canine communication is essential. Do not give them affection or sweet talk them if they are displaying any type of unwanted behaviors, instead correct them sternly with a air of calm authority. French Bulldogs are clean, and most will try to avoid puddles. Most cannot swim so take caution around water. This breed does best with considerate children who know how to display proper leadership. This breed may drool and slobber; however a good percentage of them do not. They are also a relentless hunter of mice. Do not allow this sweet little bully to develop Small Dog Syndrome. 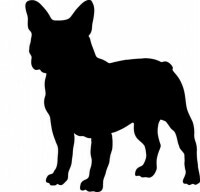 There are two weight classes of French Bulldog: 19-22 (9-10kg.) pounds and 22-28 pounds (10-13kg.). Over 28 pounds is a disqualification. French Bulldogs are prone to joint diseases, spinal disorders, heart defects and eye problems. Dams often have to deliver pups by cesarean section, because pups have relatively large heads. They often have respiratory problems. They tend to wheeze and snore and have trouble in hot weather. Prone to heat stroke. An overweight Frenchie may have trouble breathing, because of a swollen abdomen. Do not overfeed this breed. Putting them under anesthesia is risky because of their breathing issues. French Bulldogs are high maintenance and potential owners need to be aware that their vet bills may be high. Take this into consideration before choosing a Frenchie puppy. French bulldogs should visit the veterinarian several times in the first year for shots, boosters and check up. Then, as an adult, they should visit the veterinarian yearly for shots and check up. As they get older, six years and on, they should visit the veterinarian twice a year for check ups and shots. Remember; avoid feeding your dog sweets. 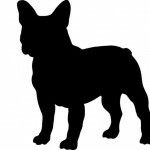 The French Bulldog has a short, smooth, fine and brilliant coat. They are average shedders and should be brushed regularly. Brushing will help them maintain a clean and healthy coat. Their teeth should be brushed at least twice a week with toothpaste and toothbrush designed for dogs. Brushing removes the accumulation of plaque and tartar which can cause cavities (rarely) and periodontal disease. Dog periodontal disease can lead to pain, loss of teeth, bad breath and other serious disease. Toenails may need to be examined for growth and clipped regularly. The toenails of the rear feet grow slower than the toenails of the front feet. Generally a guillotine type trimmer is the best for this chore and competent instructions to accomplish this can be found on the net. The French Bulldog can live between 10 and 14 years with proper nutrition, medical care and excellent living conditions. The French Bulldog originated in 19th Century Nottingham, England, where Lace makers decided to make a smaller, miniature, lap version of the English Bulldog, that were referred to as “toy” bulldogs. In the 1860’s when the Industrial Revolution drove the craftsmen to France they took their dogs with them. The toy bulldogs became popular in France and were given the name the, “French Bulldog”. The breed eventually made its way back to England for dog shows. The Britts were not happy with the name “French” given to a dog that was originally from England, however the name “French Bulldog” stuck. Love this website,I have been the very proud mom of a frenchie for just over a year now,I LOVE MIA SO MUCH,can’t find the words to express how much Love & Companionship she has brought into my life. I take her with me anytime I can,we just love to be together.If you haven’t met a frenchie you are missing a truly wonderful experience,I fell in love right away & I’m still in love.She gets along great with other dogs & everyone who meets her loves her too,I’m asked to bring her to the local supermarket,drugstore & Tractor Supply,they will say “it’s time for you to bring MIA to see us so will you bring her with you on your next visit ” so I take her on a round of visits,she enjoys it as much as they do.Frenchie Lover Forever!!!!!!! Love your website,Frenchie Lover Forever!!!!!! Sorry,I got carried away.I do love your website & Frenchies,since my husband and I have trained dogs for 27 years,French Bulldogs aren’t a challenge for us,all you need is love and patience. bookmark your blog and may come back down the road. I want to encourage that you continue your great posts, have a nice weekend!